DURHAM, NC -- Grayson Allen has thrived for No. 12 Duke in two games with Atlantic Coast Conference-leading scorer and rebounder Marvin Bagley III sidelined with a knee injury. Perhaps the Blue Devils have found a couple of new twists to implement once Bagley returns. Allen scored 25 points and matched a career high with seven 3-pointers, helping No. 12 Duke beat Virginia Tech 74-52 on Wednesday night. With Allen playing more at the top of the offense, he followed his 23-point performance in Sunday's win without Georgia Tech with his best scoring output in a league game after several struggle-filled nights. Allen came into the game shooting 35 percent from the field, but made 9 of 17 shots and 7 of 15 3s - the last sending him backpedaling upcourt with a sly grin and a look to the roaring "Cameron Crazies" as the Blue Devils (21-5, 9-4 ACC) turned it into a second-half rout. 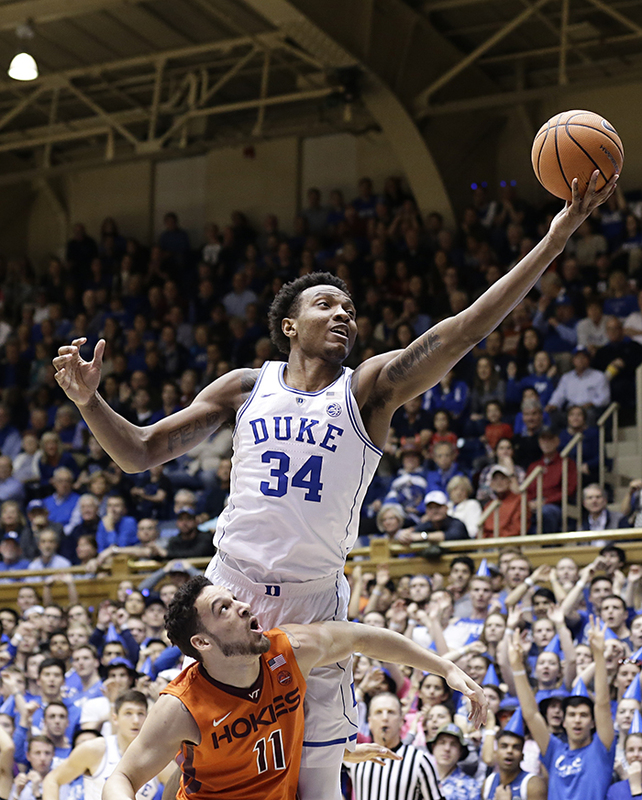 Duke's Wendell Carter Jr. shoots over a Virginia Tech player. "It felt good," Allen said of his shot. "A few of them I knew they weren't going in as soon as they left my hand. But the rest, I wasn't thinking about anything, just looking at the bottom of the net." Duke coach Mike Krzyzewski pointed to the shift that has Allen playing more at the top, which pulls defenders out to expose penetration lanes on the sides. "With the ball in his hands, he can make plays and he can call plays," Krzyzewski said. "He's more in command, so these last two games, that's a big change for us." Virginia Tech coach Buzz Williams felt the impact of the tweak, noting that Bagley shoots "99 percent" of his attempts on the left side of the floor. "That changes the complexion of their team," Williams said. "Obviously, I think Bagley's incredible. But with Allen touching the ball so much more, not only is he going to shoot more, but I think he probably facilitates the play on both sides of the floor a lot more." Justin Bibbs scored 15 points to lead the Hokies (18-8, 7-6), who shot 43 percent but couldn't get out in transition. It resulted in Virginia Tech's lowest output since scoring 52 in a home loss to Virginia on Jan. 3; the Hokies had scored at least 80 points in eight of 10 games since. Virginia Tech: The Hokies certainly arrived with confidence after Saturday's overtime win at now-No. 1 Virginia, which tops an improving NCAA Tournament resume. But the Hokies couldn't follow with another big one, and it didn't help that leading scorer Justin Robinson (13.8 points) finished with five points on 2-for-10 shooting while being limited by foul trouble. "I don't think they could've handled anything better," Williams said of his team's two-win response since losing to Miami on Feb. 3. 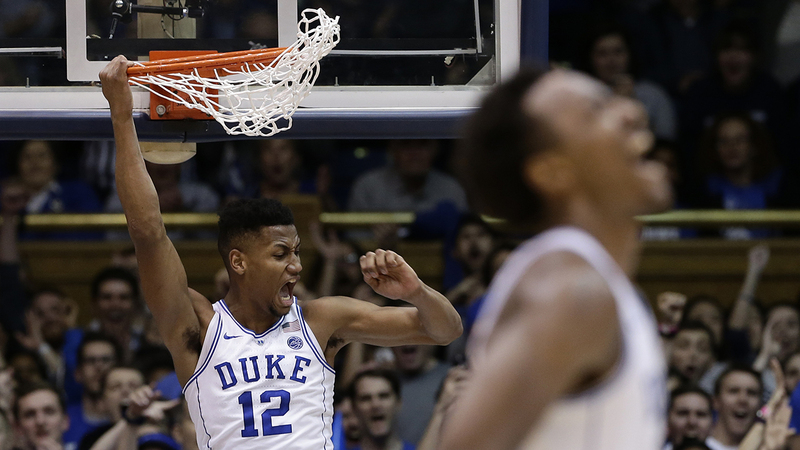 Duke: While Bagley recovers from a sprained right knee, Duke turned in probably its best start-to-finish defensive effort. And in one positive sign of many, Duke overwhelmed Virginia Tech on the glass (36-19) and took an 18-2 edge in second-chance points. Freshman Wendell Carter Jr. led that effort with 13 rebounds, while his five offensive boards were more than the Hokies had as a team (three). Freshman Gary Trent Jr. added 19 points and five 3-pointers, part of Duke's 15-of-33 showing from behind the arc. "They take away the middle, they take away the lane," Krzyzewski said. "So we told Gary and Grayson: 'Just shoot. You're going to get shots. And don't worry about it.'" Duke stuck with its zone defense throughout this one, and it sounds like it's here to stay. "We will play a lot more zone," Krzyzewski said. "That'll be pretty much our primary defense and then complemented by man." Virginia Tech: The Hokies complete a three-game road trip Saturday at Georgia Tech. Duke: The Blue Devils visit No. 11 Clemson on Sunday, a key matchup in the race for second in the ACC far behind top-ranked Virginia.